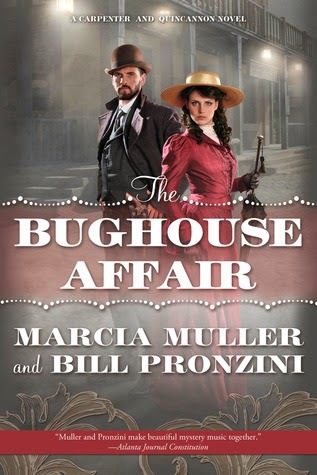 This book is an expanded version of Pronzini's story "The Bughouse Caper," in which his and his wife Marcia Muller's 19th century American detectives John Quincannon and Sabina Carpenter encounter Sherlock Holmes during the Great Hiatus. Holmes also appears in the Quincannon and Carpenter novel following this one, The Spook Lights Affair. Quincannon and Carpenter's second published appearance was in Muller and Pronzini's book Beyond the Grave, which had a framing sequence involving the manuscript of the case being discovered by Elena Oliverez, curator at the Museum of Mexican Arts in Santa Barbara. Prior to Beyond the Grave, Elena was the protagonist of two other novels by Muller, The Tree of Death and The Legend of the Slain Soldiers, which therefore also take place in the Crossover Universe. Win included "The Bughouse Caper" in Volume 1, and I'm planning to read The Spook Lights Affair and Beyond the Grave so that I can include them in the new volumes.